Last night, I dreamt that I was in a forested area. It was in the early hours of dawn or evening  I couldn't tell. All I know is there was not that much light entering into the canopy of the lush green forest that I was in. I saw trickles of fast flowing water as I stood alone by myself on a muddy dirt road that ended in a fast-moving stream. Lots of insects, birds, and other unfamiliar noises came from around me. But what really captured my attention was the many many large-size snakes that were hanging from the tree tops and a few in the river ahead of me. I saw one large python swallowing whole a dead animal and another yellow python staring at me from the river bed. Seeing that I was all alone and not knowing what to do, I immediately closed my eyes and screamed at the top of my voice expiring all the air inside my lungs with the words,"Muruga! Muruga! Muruga!" When I opened my eyes after forcefully expiring my lungs, I found my self in a shrine room of a house unfamiliar to me. But I did see something that I did immediately recognize, a glistening pure golden statue of Sri Skanda  a live replica of the form painted on Hilda Charlton's book, Skanda [see figure on right]. The beautiful figure of Murugan was about 1 foot tall. I recall seeing the beautiful vel in the right hand of Sri Skanda. Performing the anjali mudra, I humbly bowed before Sri Skanda. Then the father of the house wearing a white veshti and vibhuthi on his forehead, stepped forth and performed alangara puja and aarathi. 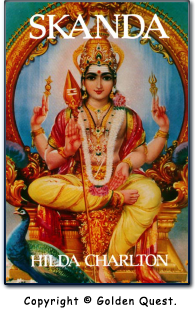 He adorned Sri Skanda with two flower garlands. After aarathi, he took one of the garland and placed it around the neck of a little boy  whom I presumed to be his son (?Murugan). The second flower garland adorning Skanda was removed by the father and placed around a little girl  whom I presumed to be his daughter (?Valli amman). The age of both children were no more than 4 yrs old. Next, the father and his wife left the room to enter their dinning room. The young boy said [in Tamil],"engal-odE vanthu sapadungO (come and eat with us)." I followed the boy who escorted me by my right hand. Both he and the little girl sat at the dinner table along with their father and mother. I joined them and a small plate of prasadam was placed before me by the mother. I didn't notice the faces of the father or mother clearly since I was wondering why the children were wearing flower garlands around their necks while eating dinner? As I put the food into my mouth, I was transported from their home to a temple. I was standing next to a priest and was helping him make some prasadam for a special festival. Both he and I were chanting the Sri Suktam while making food. I then awoke.